Welcome to language-easy.org! Well, as you have clicked on this article about the German present tense, I suppose that you are ready the learn everything you need to know about this basic tense in the German language. So, this most commonly used German tense united them all: Compared to the English language, the German present tense represents the simple present, the present progressive. Even the Future tense can be expressed by the German present tense. So, although you might think that this tense is not the big deal, you should master it due to its crucial importance. In the following, I’d like to talk about the definition and correct usage of the German present tense. Furthermore, the conjugation is an important part of this article. Unfortunately, there are also some exception in the conjugation of verbs in the German present tense. But, don’t worry: We will talk about them in detail later on. By the way, in case you’d like to have some background information, just have a look at this article on Wikipedia. Now, let’s not use too much time and go straight to the first point of this article, the definition and correct usage of the German present tense. Los geht’s! Well, first of all we should clear up what the German present tense actually is. So, as I have already mentioned, this tense is quite universal – you can use it in many circumstances. The German present tense, or also called the simple present (“Präsens” in German), is used to talk about the present and the future in German. So, as I have already mentioned, this language stand for the progressive present and the simple present compared to the English language. Furthermore, it is used to expressed the future! Well, in the following, I’d like to list the most important ways of usage of the German present tense. Second, you can express an action that takes place in the present once, repeatedly, or never. Example: “Er steht immer um 5 Uhr auf.” – He always gets up at 5am. Third, this tense expresses an action that expresses how long something has been going on. Example: “Philip spielt seit sieben Jahren World of Warcraft.” – Philips plays World of Warcraft for seven years. Fourth and last, the German present tense expresses a future action that is already planned or agreed upon. Example: “Nächsten Donnerstag fahre ich nach Hause.” – Next Thursday, I am going to go home. So, as we have cleared up the usage of the German present tense, let’s come to the next topic of this article and talk about the conjugation of verbs in the present tense. Now, we have reached the central topic of this article about the German present tense, the conjugation of verbs in this tense. Unfortunately, there are irregular verbs and some exceptions, but don’t worry, we will talk about that later on in detail. So, let’s come to the first table about the conjugation of regular verbs in the German present tense. Unfortunately, the two most common verbs in the German language, “haben” (to have) and “sein” (to be) are irregular verbs. Because of that, we will have a look at the correct conjugation of these two verbs in the following table. Please, try to keep the irregular conjugation of “sein” and “haben” in mind! Well, they are simply of high importance in their function of auxiliary verbs in different moods and tenses. And now, let’s talk about the exceptions in the conjugation of verbs in the German present tense. 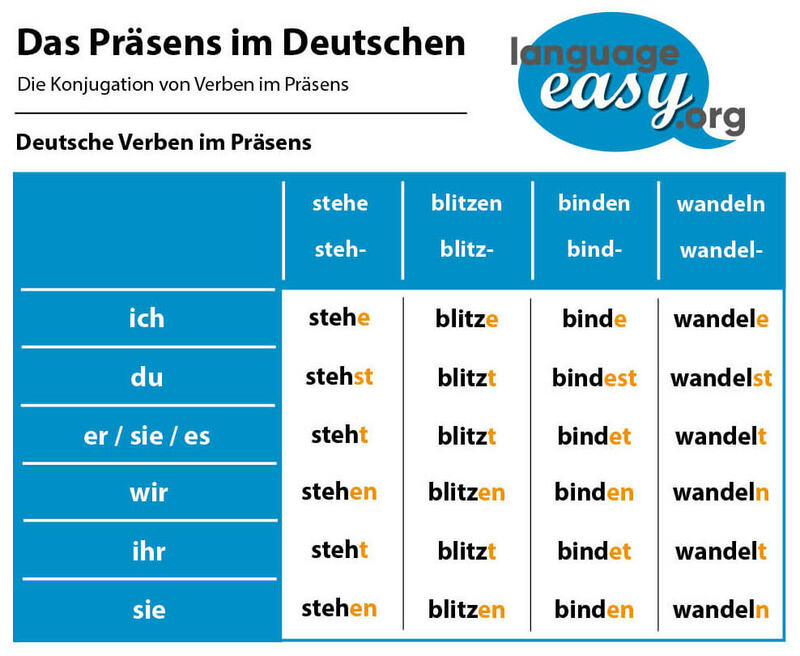 In the following, I’d like to list up all the exceptions in the conjugation of verbs in the German present tense. First, if the word stem ends in d/t, we add an e before the endings ‘-st’ and ‘-t’. Third, if the word stem ends in ‘s/ß/x/z’, we remove the s in the 2nd person singular ending. Fourth, if the word stem ends in ‘ie’, we remove the ‘e’ in the ending. Fifth, the word stem changes in some strong verbs. Sixth, if the infinitive ends in ‘-eln/-ern’, we remove the ‘e’ in the ending. Seventh and last, in the case of ‘-eln’, we can also leave off the e from the word stem in the 1st person singular.